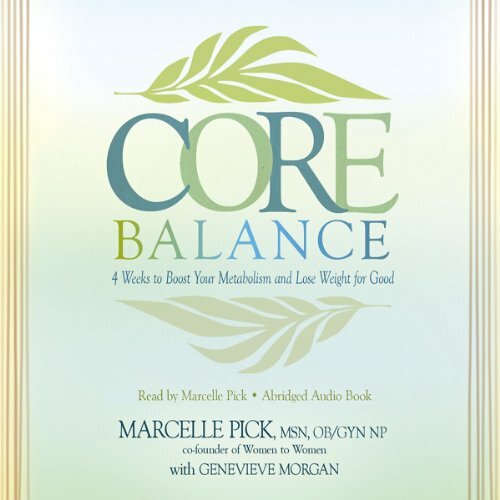 Marcelle Pick draws upon decades of patient and personal experience to solve the mystery of stubborn, frustrating weight gain in women, whether you've just gained it or have been struggling with it for years. This breakthrough program, which has benefited many of the thousands of women who visit the clinic each year, is rooted in cutting-edge nutritional science that explores the weblike relationship between women's hormones, metabolism, and weight gain. In clear terms, Pick connects the dots between self-knowledge, self-care, and the ability to lose weight, extending the concept of body-mind-spirit to demonstrate why and how a woman's biography becomes her biology. At its most basic level, The Core Balance Diet shows you how to self-diagnose one of six major biochemical imbalances that may be preventing you from losing weight. These include digestive, hormonal, adrenal, neurotransmitter, inflammatory, and detoxification imbalances. From there, Pick guides you through easy lifestyle and diet changes customized to heal your specific imbalance. Throughout, you will learn how to begin living in a manner that encourages optimal health - without a lot of deprivation and stringent dieting rules - by achieving core balance from the inside out, and, of course, weight loss for life. After listening to this audio, I purchased the hardback copy. I have to say that there is not a lot of new information in this book that is not already out there. Although I did appreciate the section on the precise vitamins that are necessary for this time in our lives. What did you like best about The Core Balance Diet? What did you like least? It was a good review of information, but right from the beginning it droned on and i felt I was loosing interest fast. Got to about the middle and I never finished it. I prefer a mans voice and felt hers was a little to monoistic. For someone just starting on the nutrition, weight loss, life change journey, it might be a blessing. But as a nurse and clinical hypnotherapist, I felt it needed to "grab" you with something great in the beginning to keep the energy going. I didn't feel there was real intensity in her voice. it's ok, good information but not for me. This book helped me understand how our minds, bodies, and spirit work together. Yet, There is so much more to learn!